Keanu Reeves was born in Lebanon. He is one-quarter Chinese, one-quarter Hawaiian, half-English, and a Canadian citizen. He attended four high schools, playing hockey and soccer before dropping out at 17. He was raised in Hawaii, Australia, New York, and Canada, where he did his first professional acting. His name comes from a Hawaiian word loosely translated as "cool breeze over the mountains". At 16, he was in a Coca-Cola commercial, and featured in the Canadian sitcom Hangin' In. He later did a Kellogg's Corn Flakes commercial, spent a summer studying acting at the Hedgerow Theatre in Pennsylvania. He briefly co-hosted a kids' show in Canada, with Chris Makepeace. 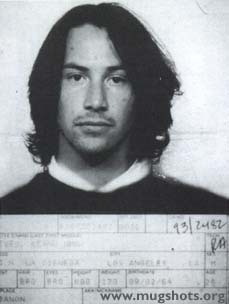 At 22, Reeves came to Hollywood, and slept on his former stepfather's couch until he moved on to his own apartment. In early roles, he played hockey with Rob Lowe and Patrick Swayze in Youngblood, and played a troubled teen in River's Edge with Crispin Glover and Dennis Hopper. He danced Jack-Be-Nimble in a TV production of Babes in Toyland starring 11-year-old Drew Barrymore. In 1989, still playing a teenager at 25, Bill & Ted's Excellent Adventure made Reeves a star. In 1994, Speed with Sandra Bullock made him an A-list star. As a young actor, Reeves' best friend was River Phoenix. They made My Own Private Idaho together, and joked about filming Romeo and Juliet with Reeves as Romeo and Phoenix as Juliet. Reeves was filming Speed when Phoenix died. Reeves' life has had its share of tragedy. His sister Kim is battling leukemia, and Reeves has reportedly spent in excess of $5 million on her medical care. He has long been estranged from his natural father, who served a prison term for selling heroin. He dated a backstage Hollywood worker, Jennifer Syme, who bore his stillborn daughter in 1999. They broke up but remained friends, until she was killed in a 2001 car accident. During his long career, Reeves has occasionally disappeared from Hollywood for a year at a time, and he turned down a $12 million offer for Speed 2 to do Shakespeare on stage in a small Canadian theater. He is famously generous with his money, lavishing large gifts on charities and for his movies' backstage workers. A Buddhist and a pacifist, he opposes war on principle, and has turned down several films because the part seemed too violent. Reeves has spoken of using drugs, but is understandably reticent to discuss which drugs he has used. He often says drugs have given him some "amazing" experiences, then pauses, then says "amazing" a second time. "With Matrix behind him", Associated Press, 5 November 2003.